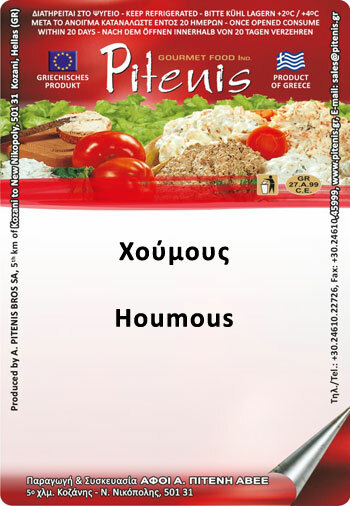 hummus salad - A.Pitenis Bros S.A. Gourmet Food Ind.. The hummus is a traditional Ancient Greek salad, creamy, consisting of chickpeas, tahini, vegetable oil, garlic and plenty of lemon. 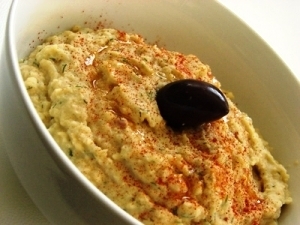 The Houmous Salad, or more correctly «the hummus», a combination of sesame and chickpea. It contains tahini, grounded chickpeas, lemon and garlic. The sesame is a derivative of sesame, basically paste of ground sesame. It is a creamy salad, used in the Middle East as an appetizer. Drizzle the hummus with a little raw olive oil and garnish with lemon slices or cayenne pepper. Decorate with some parsley leaves or with an olive! Puree in multi chickpeas in a tin with the lemon juice, tahini, garlic and salt. Continue adding the oil little by little (as we do in mayonnaise). Grind until a velvety, tight cream. Transfer the hummus into a wide bowl and place over the remaining chickpeas, pine nuts, pomegranate and sardine fillets cut by hand. Pour a little more olive oil and sprinkle with parsley or coriander and cumin.